"The difference between an applicator and a tradesman is in the details." WE ARE EXPERIENCED WITH 35 YEARS OF PROBLEM RESOLUTION HISTORY. WE SPECIALIZE IN SOLVING PROBLEMS. CALL US WITHOUT DELAY! REMEMBER YOUR PROBLEM IS OUR PROBLEM!!! 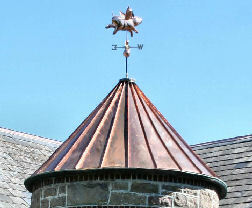 Read about this turret copper roof restoration in Bethlehem, Pa.
Our Fiberglass Roof Deck Repairs are performed by our skilled professionals that are adept at addressing the intersections of the various trades where problems often occur. If you want something unique that nobody offers, call us! 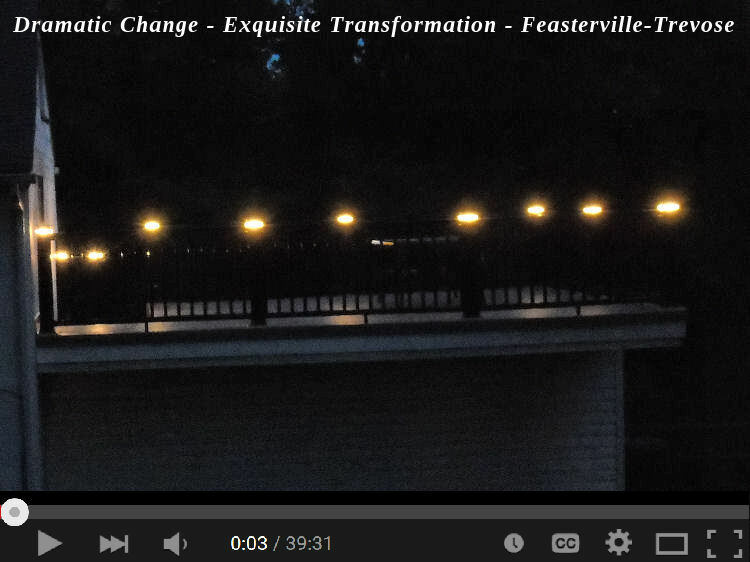 Check out this video to the left; Key West Style Copper Clad Fiberglass. No troublesome joints - Monolithic! Chimney Flashings are the most problematic on sloped roofing. Chimney Leaks are usually caused by poor workmanship. We serve the Philadelphia area. Often overlooked and not given proper attention and value, these roof junctures are of great importance. 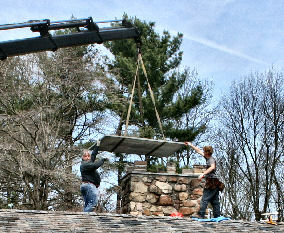 Even with new roof installations, chimney flashings are ignored. Visited by novices and often caulked and sealed with inferior methods, resulting leaks cause severe damage. 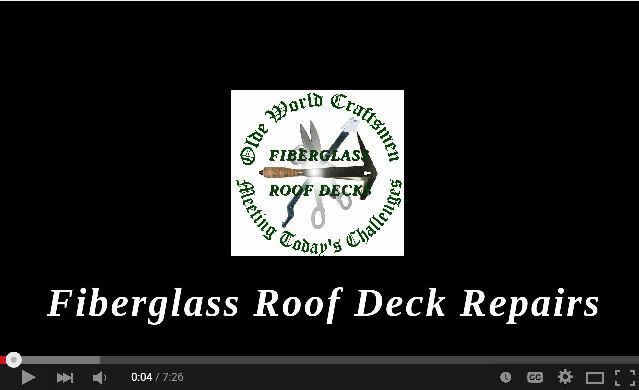 To the left is a video of a real jewel of a Fiberglass Roof Deck. With all of the accompaniments, this deck sets itself apart from all others! A very unique property nestled into a hill in Bucks County, Pa. affords a one-of-a-kind expression in architecture. Average Roof Plumbing Vent Pipe Flashings are usually made to fail and only last 12 to 15 years on sloped roofing. Roof Pipe Flashings Leak and are usually in need of premature replacement. We serve the Philadelphia area. Plastic or rubber booted pipe flashing last only 12 to 15 years. Why is this acceptable in the roofing industry? Philadelphia Cool Roof Coatings, a way of prolonging flat roof life while cooling the interior. We serve the Philadelphia area. MORE REASON TO MAINTAIN: It has always been the case that low sloped roofing often fails because of lack of maintenance but never have the Sun's rays been harsher and never have the coatings been so formidable. EPDM Roof and accompaniments provided for a low sloped roof where client wanted Standing Seam Metal but the slope was too shallow. Copper cladded EPDM Rubber was the answer. Watch the video for more information. Philadelphia Yankee Gutters and Built-in Box Gutters. We serve the Philadelphia area. Slate Roof installed probably by experienced roofers - but not experienced in the arts of metal work. This is a common problem! Fiberglass Roofs are ideal for extending your living area onto the rooftop in the Philadelphia area. The traffic bearing roof has long been an enigma because manufactured roofing material offerings are not really traffic bearing. Wood decks have been built atop roofing membranes for years and we now are picking up the pieces from this ridiculous methodology. [Your user agent does not support frames or is currently configured not to display frames. 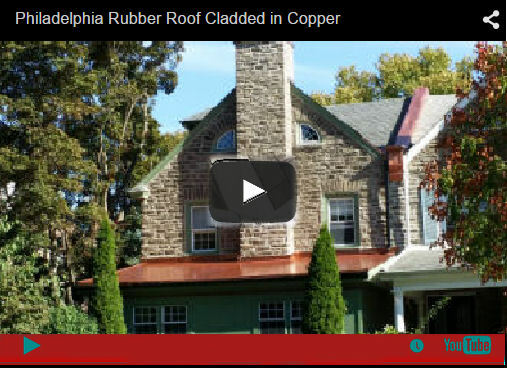 However, you may visit for videos related to Fiberglass Flat Roofs and Fiberglass Roof Decks, Copper and Slate, Mold Remediation in the Philadelphia Area By, Robert Wewer.] This is a copper parapet cap made of monolithic fiberglass! With no joints to fail and minimal thermal movement, this cap will afford a lifetime of service while reflecting an historically accurate and appealing copper cladding. This is the best way to cap off a troublesome parapet. Mold Removal with a Guarantee in the Philadelphia area. The latest in technological advances in underlayments have manufacturers, applicators and contractors following bad methodology. The video linked to the left stands as a warning the the industry to wake up and go back to school and learn sound building practice. Built in, Box and Yankee or Philadelphia Gutters are an architectural expression of days gone by and they have a common issue the plagues them: Metal Thermal Movement! Allowances must be made for thermal movement. DO not allow a novice to provide a cheap fix. It will fail. Copper is the liner of choice and the few hundreds you save on materials will cause you a nightmare later. Labor savings on the cheap fix is money wasted and the resulting damage can be costly. Mold Removal Frost on Nails Moisture in the Philadelphia area. Industry's answer has long been to properly ventilate your attic. While this is always beneficial, remember there are plenty of troubled attics with mold present that are ventilated properly. If you have: Frost, Moisture or Mold in your Attic, give us a call to inspect. Roof Ice Dams are the source of major destruction but they can be avoided. How much does it cost to do it right? Are you tired of dealing with novices? Are you overlooking hidden problems that can be made worse when an uneducated contractor sells you a retrofit of siding, windows, roofing, insulation? Word to the wise: Draw the line at 4 inches rise per foot as minimum slope for roofing shingles, no matter what anyone states (manufacturers, architects or roofers). No underlayment should serve as a roof. (Right) Low Slope Roofing Shingles cause Leaks and Mold inside home. Mold Inside Walls caused by bad engineering and building practices and emphasis on underlayments and "wrapping" up the walls for a tighter building envelope with total disregard for trapped interior moisture vapor and dew points within the walls cause havoc! Mold Remediation: Inspecting, Testing, Finding and Killing Mold is Easy! Preventing its return is the challenge many companies fail to answer.